Ever hear of a Scoot Coupe? It almost sounds like a new ice cream dish, but it’s a jazzy, three-wheel, open side-by-side two seat scooter that looks, and is, fun to drive. With just a half-gallon of gasoline, the Scoot Coupe can go 80 miles at 30 mph. It’s also easy to maneuver and is licensed for the battlefield and state roads. “It’s a new and exciting way to tour the battlefield and surrounding area without being in a cramped bus or car,” said Josh Hensen who, with his dad, Dave, are the proud owners of the new scooter rentals, Getty Peds, at 39 N. Washington St., Gettysburg. The store is around the side of the Flower Boutique. Although a recent transplant from Indiana, Josh and his wife, Jaime, are no strangers to Gettysburg. A U.S. Army veteran of seven years, including two years in Afghanistan, Josh was discharged in 2007 and entered the insurance business. “I tried it for awhile, but it just didn’t feel right,” he said. Remembering all the times they enjoyed Gettysburg, Josh and his family and parents, Dave, a retired teacher and basketball coach, and Mindi, resettled here and went into business together. Rental prices for the two-wheel scooters are $10 per hour or $40 for the day, 8 a.m. to 6 p.m. Twilight rentals, 6 p.m. to 8 p.m., are $15. Prices for the Scoot Coupes are $30 per hour or $100 for the day, 8 a.m. to 6 p.m. Twilight rentals, 6 p.m. to 8 p.m., are $25. A six percent sales tax applies to all rentals. Getty Peds is open seven days a week, from 8 a.m. to 8 p.m. The phone number is 398-2600. The Scoot Coupe three-wheel scooter suffers from the same ailment of their 2 wheeled scooter counterparts. Sure there probably fun to ride around in, but you don’t want any of your friends to see you out for a night on the town while driving one. The scooters which are made by US owned and operated Panther Motors offer three-wheels with a sleek 2 seat design. They also come in two engine sizes 50cc and a whopping 150cc. While the engines may not be huge, the 80mpg they can achieve will surely draw some interest, especially from city drivers looking for a small alternative to their cars that is a whole lot easier to parallel park. 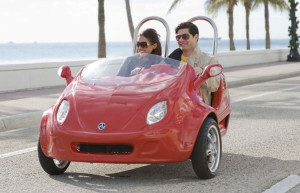 Visitors to Hawaii can rent convertibles, four-door compact cars, Hummers, mo-peds, Harley-Davidsons — and now, scoot coupes, or three-wheel scooters. Basically, it’s a scooter with three wheels (two in front and one in back) that can seat two and go up to about 40 miles per hour. MiniCoupe Hawaii, a new business launched in February in Waikiki, occupies this new niche and plans to open a dealership soon to sell the scooters as well. The business, owned by a San Francisco couple, is the exclusive dealer in Hawaii for Scoot Coupe, which is manufactured by Panther Motors in Florida. Other cities on the mainland already rent out the coupes — in San Francisco a company rents them out as GoCars. 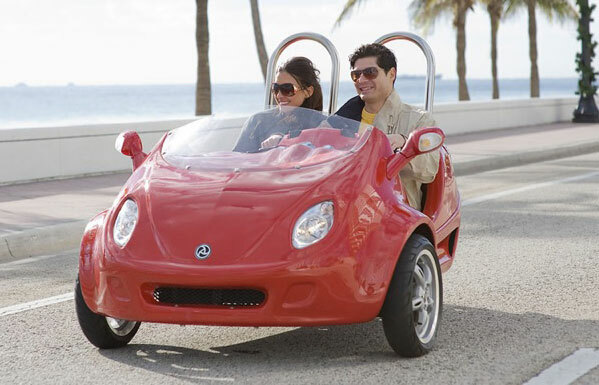 In Hawaii the coupe is categorized as a mo-ped, and thus, only a driver’s license is required to operate it. Helmets are available, but not required for adults. Jacob Wankasky, MiniCoupe Hawaii’s sales manager, says the company has a fleet of about 30 that get rented out daily. Most customers are visitors but about 25 percent are local. East Oahu drivers likely have spotted the coupes coasting along Kalanianaole Highway or even as far up as the North Shore. The scoot coupes are not allowed on major highways, including the H1, H2, H3, Pali or Likelike, although a few occasionally stray there by mistake. Wankasky says every customer is given an orientation, along with a map, showing where they can and cannot go. 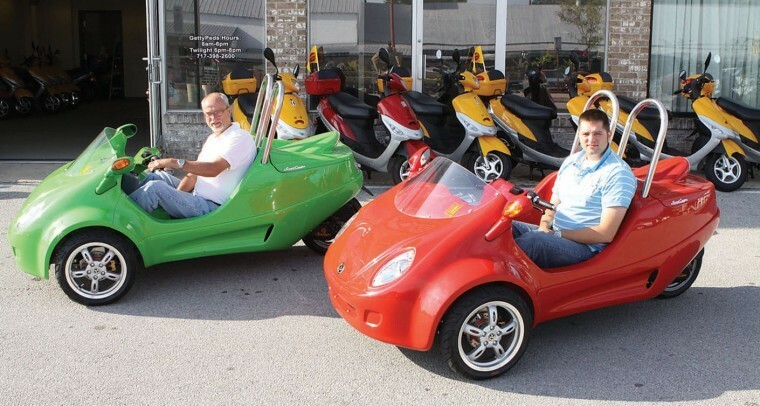 People of all ages have been renting the scoot coupes, he said, but they have been particularly popular among baby boomers. Tony and Mary Salazar of Los Angeles opted to rent a scoot coupe from MiniCoupe Hawaii for a half-day yesterday, instead of a rental car, deciding it was a more interesting way to see Oahu. The couple was celebrating their 30th wedding anniversary. “;It handles nice,”; added Tony Salazar. For an additional $20, coupe renters can take a GPS-guided tour from Waikiki to Lanikai, complete with narrative information. The company also highlights stops like Leonard’s Bakery and Giovanni’s shrimp truck. Two models are available: the standard edition and the limited edition. The latter has more luxury features, including an iPod hookup and a four-stroke engine. The coupes retail for $6,299 to $6,599, according to the manufacturer’s Web site. There’s a three-wheeled newcomer on the streets of O’ahu — the Mini Coupe — although it’s actually a two-seater moped. 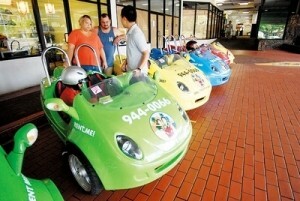 Mini Coupe Hawaii sales manager Jacob Wankasky said the company started renting the brightly colored little vehicles in February from a fleet of 31 based at the Hawaiian Monarch Hotel on Waikiki’s Niu Street. 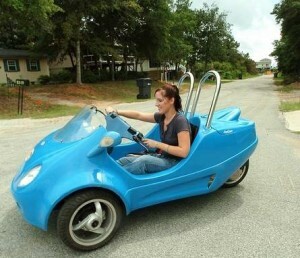 He said the company bought the coupes from a previous owner who had purchased them three years ago but needed to get legal approval for the three-wheeled two-seaters. Wankasky said that came through last year. Despite a current downturn in tourism throughout the state, Wankasky said business is picking up a little more each week, especially on sunny summer days. “We sell out a lot, depending on the weather,” he said. He said most people call to find out more when they see the coupes on the road. The company also rents a space near the Waikiki Beach Marriott Resort & Spa. Riding in the little convertibles offers an obstructed view of the sights and sounds of the street scene. The motor starts up like a moped, sounds a little like a lawn mower and turns heads among the curious, prompting some people to wave or shout from the sidewalk. “People feel like celebrities for a day,” Wankasky said. Jena and Gary Morris of Roanoke, Va., rented two of the coupes Thursday morning to take a half-day trek to Diamond Head, the Kahala Hotel and out toward Hanauma Bay with their sons, 6-year-old Abram and 5-year-old Joshua. Why the sporty two-seater moped? “I have two boys and that’s what they want to do,” explained Jena before buckling up and heading out. Operations manager Eric Soh gave the Morris family an orientation, telling them not to drive on five roadways: H-1, H-2, H-3 freeways, Pali and Likelike highways. “No sharp turns, and be gentle with the gas,” Soh suggested. He also walked them through an inspection reminiscent of the rental car routine: look for major scratches, check to see if the gas tank is full, and he warned them that’s there no reverse, so the best way to back up is walking next to the coupe like a bicycle. Wankasky said people can rent a GPS tour that takes them turn-by-turn to their destination. He said the most common trip is out to East Honolulu, although some take a seven-hour trek to the North Shore and back. So far, he said the celebrity clients have included musicians Lil’ Wayne and Erykah Badu. The company is running 25 of the older two-stroke model; and six of the more powerful four-stroke engines. Wankasky said the company plans to buy more of the more powerful models as the company expands. Police did say a few of the vehicles have received tickets when renters take them on the freeway, where mopeds and other slow-moving vehicles are banned. And Wankasky says other drivers also will call to report seeing the coupes on the Pali or freeway or anywhere they think they don’t belong. He said the staff tries to reach the drivers to remind them of where they should and shouldn’t go. Wankasky would not identify the company’s owner, but state Department of Commerce and Consumer Affairs records show the company was registered Nov. 21, 2008, by agent Jennie Hanaoka. Each of the coupes now include the company name, phone number and the biblical citation John 3:16. Soh said that’s a reflection of the Christian family owner’s beliefs. “They feel like it’s a blessing for the opportunity to be here,” Soh said. PARKERSBURG – If Market Motors is successful, brightly colored three-wheeled vehicles soon will be tooling around the Mid-Ohio Valley this summer. 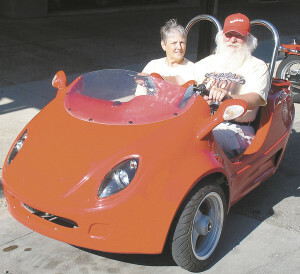 A local Santa Claus has a new type of sleigh for his warm weather appearances. Ken and Alice Vergauwen, of Marshalltown, have been seen in town in their 2007 Scoot Coupe, a two-seat scooter from Panther Motors in Florida. Ken said his daughter was doing research on motorcycles when she came across the Scoot Coupe and passed along the information to him. The vehicle is powered by a Piaggio Italian-made engine and can reach speeds of 35 miles per hour. It is licensed as a moped and is fully street functional. Ken appears in parades and at campgrounds as Santa and this vehicle will suit those situations. One drawback is there is very little padding for the seating which may lead them to add more. “It’s a little bumpy,” Alice said. With a vehicle that small the fuel mileage helps make those high gas costs go farther. The couple just purchased the scooter so they have not been through a whole tank yet, but it is expected to get between 60 and 80 miles per gallon. “I put a gallon and a half of gas in it and have run about 40 miles and hardly notice it is down,” Ken said.